The biggest supplier of the gem in its raw form is Russia, where it is found in abundance. However, mining of the stone is one difficult task, considering the heavy snow and frosting winters. In fact, there is one variety of Charoite, which hails from the rigid weather of Siberia. That said, the consistent and pristine quality of the stone is imported from the mine located in the foothills of Murun Mountains. With the incredible patterns emerging on the surface, Charoite is often considered to be a synthetic gemstone, while it is, in fact, a naturally-occurring one. With the feather-like streaking and other dainty patterns on the surface, Charoite features as one of the most prized stones of our collection. It is widely known for its chatoyancy and opaque lustre, which makes it look almost ethereal. Ideal for bracelets and rings, the stone is mostly found in cabochons and not faceted. Charoite rates 5 to 6 on the Mohs scale of hardness, which makes it a relatively softer stone. It also means that it is prone to damage if it comes at the receiving end of a hard hit. You should also know that the stone is sensitive to higher temperatures, which means that no ultrasonic methods of cleaning or steaming should be exposed to it. There are a lot of legends associated with the stone as it is pre-dominantly found in the area where they kept political prisoners. It is believed that it helps the people cope with being away from home. Legends say that it brings peace to the students who live in boarding school, to prisoners, or the patients who have to stay in hospitals for a long recovery. It is believed by several people that it provides emotional healing and nurturing to the wearers, or to the people who feel lonely and despondent. Some also claim that keeping it makes it easier for adoptive parents to bond well with the children, where it is considered as a support crystal. Even though the stone does reflect strong healing tendencies, it is very important to note that these are just some things that healers claim. It is strongly advised that you consult a doctor or a professional in the field to get a better idea and immediate care. There are a lot of things that Charoite can heal; that’s what the healers across the globe claim. It is said that it comes in very helpful for the people with anxiety disorders or with people suffering from ADHD, autism, and Asperger’s Syndrome. It is said that the gem assists in a peaceful sleep and regulates blood pressure. 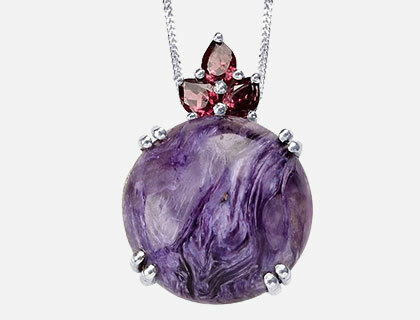 It is strongly believed that Charoite is the ideal gem if you’re facing negativity and fear. Like most of the crystals, it is said to regulate the positivity in the consciousness and expel negativity. It also allows you to scrutinize deep-embedded fears and be rational about overcoming them. It allows the person to move forward in life, without inhibitions and reservations. It has been established that the stone ranks pretty low (5 to 6) on the Mohs scale of hardness. It means that you need to take special care of this gem so it doesn’t shatter. It is advised that you don’t wear the jewellery studded with the gem if you’re going to take part in any outdoor activity that could cause the stone to break. When it comes to cleaning it, it is pertinent to note that you should always keep it away from ultrasonic cleaners as well as steam cleaners, as the stone is sensitive to extreme heat exposure. If you must clean it, you can do it at home by washing it under a stream of cool water. You may use mild dish-soap if there is persistent grime or dirt. It ranks as low as 5 to 6 on the Mohs scale of hardness, which makes it a relatively softer stone. The healers who use crystals use the stone to speed up the treatments healing the disorders of liver, heart, eyes, and more. In Mongolian culture, it is believed to ward off the evil spirits and they even consume the tea infused with the essence of this stone as it is believed to provide strength to the family. It is shipped and mined from Siberia, and involves a difficult extraction process in extreme weathers.